Action: Pay 2 to have all of your opponent's characters lose Willpower and all (T) icons until th eend of the phase. What happens when a character has Willpower twice? Does Hastur's ability, much like in AGoT, remove one instance of Willpower with each activation, ergo he has to use his ability twice to remove both instances of said character's Willpower or will one activation be enough to remove all instances? Unlike the (T) icons (or some keywords like Toughness), I don't think Willpower is "stackable." I.e. if a character with native Willpower is given "more" by an event or a support or what have you, he doesn't then have "double Willpower," he just has the same Willpower he always had, and Hastur could take it all away. 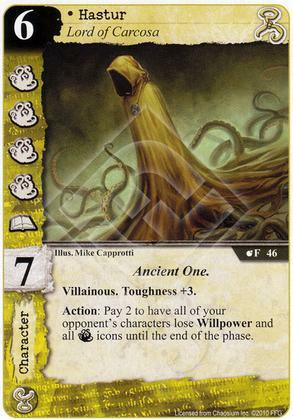 On the other hand, Hastur's action *is* a discrete event that doesn't bar the subsequent addition of Willpower. So, e.g., he might pay 2 and eliminate my character's native Willpower for the remainder of the phase, but I might, say, exhaust Black Market Artifact to put it right back. This artwork is a contender for scariest in the game. Scariest for Hastur for sure IMO. Who knows what is hidden under that ratty cloak.